A tour of the historic market town of Lewes, taking in the usual sites,and some less well known ones. This walk can be combined with any other route starting or finishing at Lewes. With the exception of part of the alternative route through the nature reserve, all of this route is on tarmac or paving suitable for wheelchairs. However some cobbles must be avoided and the climb up to the upper part of town is steep. Warning- towns change. This walk was compiled in March 2013. There may be changes by the time you arrive. 1)The walk starts and ends at Lewes Station on platform 2. Indeed at a pinch you could just walk up and down platform 2 and then get the train home, because this platform symbolises just about everything you need to know about Lewes. If you are not arriving by train you can get a good view of the platform from platform 1. In 2012 you could normally walk on to this platform from the car park, but in 2013 ticket barriers will limit how far you can go. The platform also contains the prize winning men’s toilet. (The women’s toilet also won a prize but is round the corner.) Lewes is noted for its toilets, most of which are still working, although some of them have been converted to houses or youth clubs. Have a look at the café on the platform. For many years the railway company has been trying to give the lease to a large chain. But Lewesians pride themselves on being middle class and stroppy. In 2012 the lease was given to a chain who then withdrew when faced with threats of pickets on their other outlets. If the café is still called the Runaway then the campaign has continued to be successful- The café is still independently run and sells some of the best food on the railway. If it bears the name of a chain then we will have lost. You will find the results of similar campaigns around the town. Lewes has a lot of independent cafes. Businesses as diverse as fruit and veg shops, newsagents, paint shops and florists have found it more lucrative to convert part of their shops to upmarket cafes. Sometimes only a vestige of the former business remains to satisfy planning rules. As you go round the town may be interested to note the proportion of independent shops to chains and the proportion of shops selling things that you might actually want to buy, as opposed to artisan designed organic balls of string. (Oh- you mean that you came to Lewes to buy artisan designed…………..?) This is a constant tension in the town. Many locals try desperately hard to support local fish meat and vegetable shops but their numbers are shrinking. Just beyond platform 2 to your right you will see some late 20th century terraced houses. These were built on the site of the old Lewes market. This change is perhaps symbolic of the changes the town faces. High house prices mean that there is a temptation to build everywhere and anywhere and communal facilities get destroyed for this. Every four decades or so the low lying areas of Lewes flood badly and these properties and the station are right in the flood area. Always supposing that you want to continue the walk now leave the station on the exit from platform 2, walk across the car park and up the hill ahead of you on a small street. Note the rather grand toilet on your right. At the top of the road, opposite the Lansdowne Pub turn right into Lansdowne Place. Notice the video surveillance camera above your head. In the olden days before mobile phones local drug dealers used to gather here, taking advantage of the phone box and the adjoining seat (since removed) So one of the town’s few cameras was installed here although by now the dealers had long gone. The Lansdowne is one of Lewes’s many characterful pubs. The local beer in most is Harvey’s, brewed in the town. In 2012 the Lansdowne was offering a free guide to Lewes for people who had a drink there. 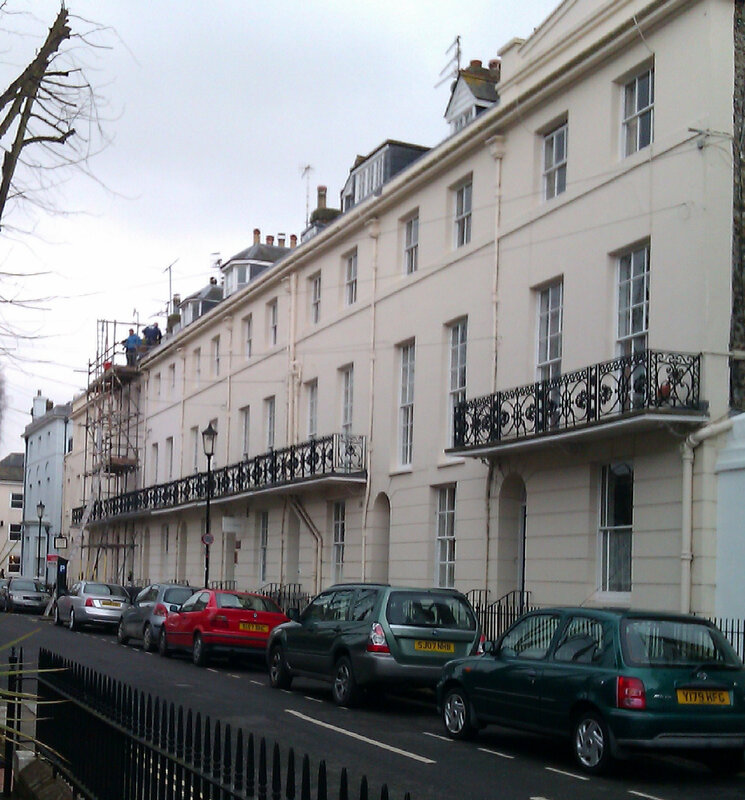 Walk straight ahead along Lansdowne Place, with its attractive houses. 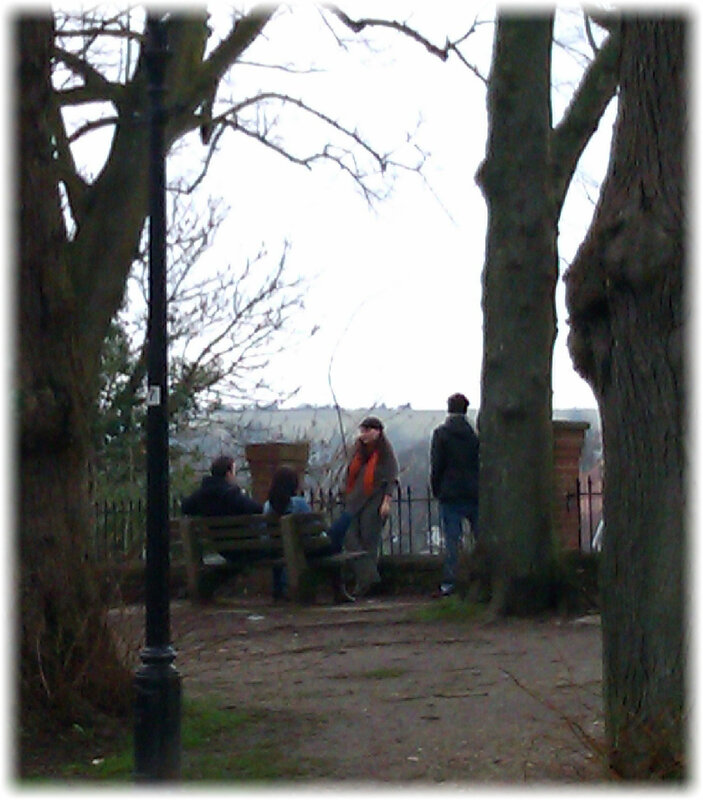 Pass Laportes, one of the many café’s in Lewes offering good food at sometimes alarming prices. As the road curves to the left and changes its name to Friars Walk you will see the old church of All Saints, now turned into an arts centre. In 2012 this centre was the site of the Lewes cinema war. The Lewes Film Club and a commercial group, Lewes Cinema had both been hiring the hall to show films. The town council, who own the building, decided that Lewes Cinema were making two much profit and only paying a subsidised rent, so replaced them with their own cinema, run by the film club administration. Lewes Cinema decamped in a huff to the Lewes Little Theatre. So in 2013 we had 3 cinema operations in a town of 18,000. Next pass the Quaker meeting house on your left. 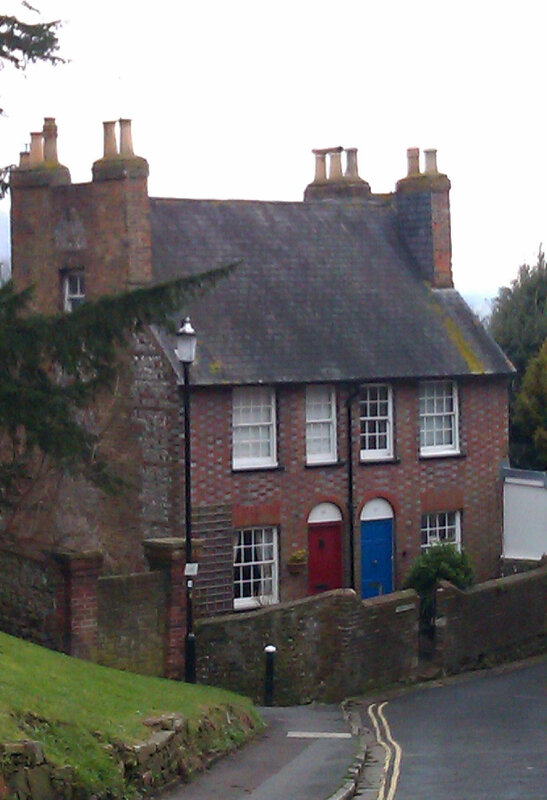 Lewes contains churches of just about every shade of protestant and non-conformist Christianity. It prides itself on the martyrs who were burned to death in the town for their beliefs in the reign of Queen Mary. Less is said about the persecutions of Catholics in Elizabeth’s subsequent reign. Pass a road that leads up the library. You may want to turn up this to see the statue of Tom Paine with a stone on his head, symbolising the way the powers that be try to weigh radical thinkers down. It is to the left of the library entrance. 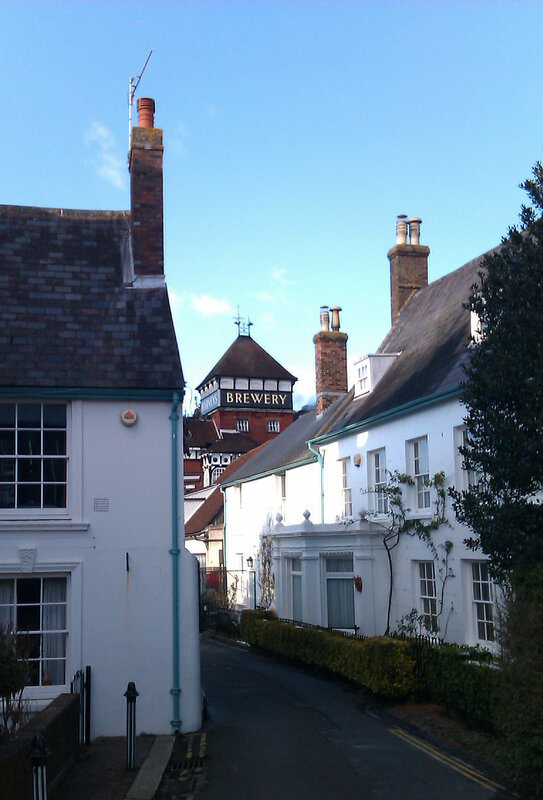 The building just after the lane is the old Lewes Turkish baths. It was very popular until a more interesting one opened in Brighton and it was forced to close. Keep straight ahead. Note an alley going off to your right. There are toilets down this alley and to the right. 2)Reach a set of traffic lights and turn right into an undistinguished pedestrian shopping precinct. Walk through the precinct. An optional alternative can be taken here. Turn right down an alley between Forfar’s bakers and the Riverside Centre. (Watch out for traffic) Keep straight ahead. Pass Greyfriars sheltered housing on your right. Enter the Lewes railway land nature reserve (I) On your left you will see the Linklater pavilion where there are sometimes exhibitions about the reserve or other ecological issues. This reserve was created out of the old railway sidings which were in use when large amounts of goods traffic were moved by rail. The main route crosses Cliffe Bridge. If it is sunny you may want to sit on one of the seats here for a while. To the south you can see the remains of the old river warehouses. 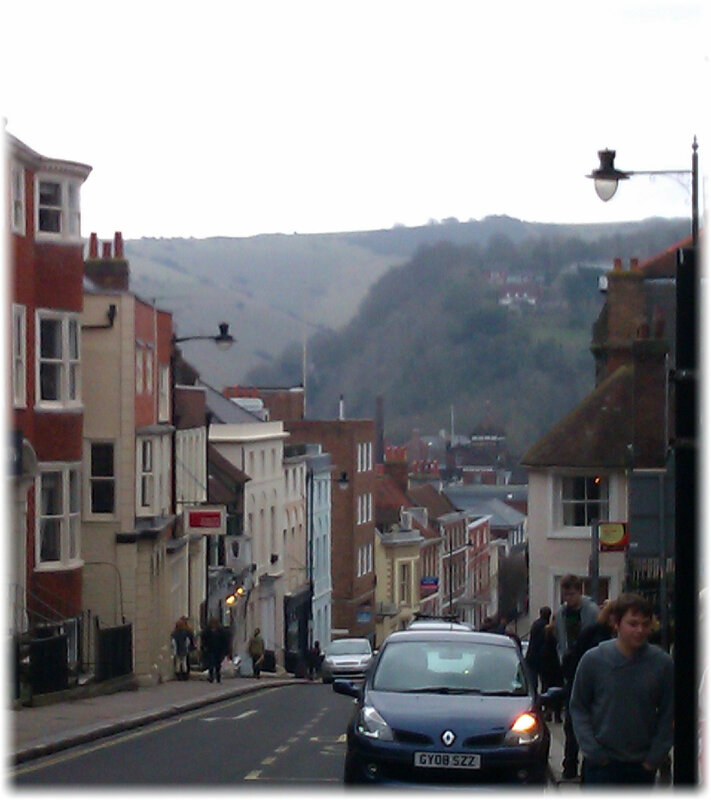 To your left is Harvey’s brewery, a Victorian structure sometimes known as the cathedral of Lewes. On the right down an alley is the John Harvey Tavern, their brewery tap. Continue along the High Street passing some of Lewes’s more interesting shops and the Gardeners Arms. This is the smallest pub in town and worth visiting. 3) At the end of the High Street turn right along South Street. (The road straight ahead leads to walks on Malling Down and spectacular views over the town, but you would need to dodge the traffic as it is very narrow) On your right notice a single story building. This is a former public toilet now used as a youth club. Walk along South Street. Notice the wide variety of largely Victorian buildings with interesting details. Reach the end of the town at the Snowdrop pub. 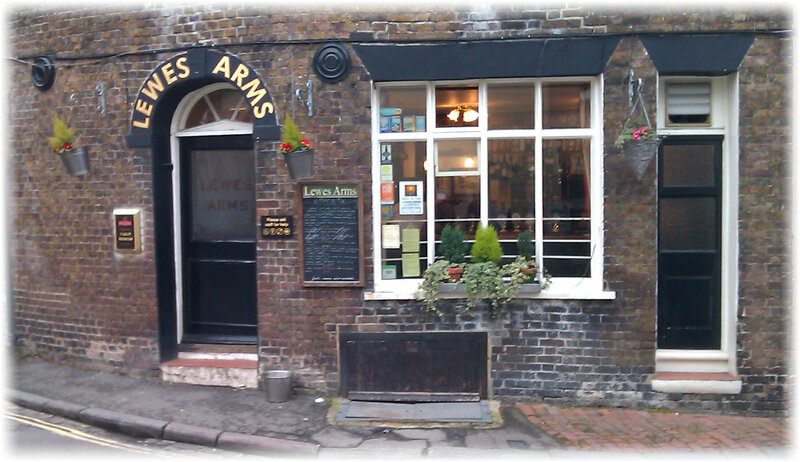 (yet another pub worth visiting) This is the site of the Lewes avalanche. Carry straight on past the chapel. Where the road turns right do not follow it. Instead make your way straight across the car park until you come to the wall of Harvey’s brewery. On your right you can see that the Lewes has the same supermarkets and similar stuff of modern life that most towns have. The road to your right is the notorious Phoenix Causway. It was the building of this road which caused the closure of the Lewes to Uckfield railway, even though it was well used. The demolition of the railway made the cost of the road much cheaper. Turn left along a path in front of the wall. This goes under buildings to emerge in the High Street again. Turn right and walk through the precinct again. This time turn right when you meet the road. You will need to cross this road and it is safer to do this at the lights, by the Cancer research shop. On your left you will see Lewes bus station (A). You could start and finish the walk here if you are travelling by bus. The bus station is one of the finer modern pieces of Lewes architecture. Look how much has been squeezed into a very small space. There are workshops, offices, bus stands a waiting room with bus information point and a café. Sadly much of this is not used. The bus station was bought by a local property developer with the idea of turning it into housing. Locals and local councils have resisted this, so the property stands in its sad state, neither renovated nor demolished. Buses still call at the station, except for the buses to Tunbridge Wells and Ringmer, which start from the stop outside the supermarket across the road. Look straight ahead. Behind the trees you can see the beginning of the Phoenix Industrial estate. Lewes has a great industrial history. The estate is on the site of the Phoenix iron works. If industrial acheology interests you, you can find a town trail detailing the influence of the works on the town here. When this was written there were plans to redevelop the area, further supressing the town’s industrial tradition. Turn left immediat ely to the north of the bus station, up East Street, and then take the first turning on the left – Albion Street. On your right in this street you will see one of only two grand Georgian Terraces in Lewes. The period was a time of great expansion in nearby Brighton, but less so in Lewes. Turn right here and climb up School Hill, which is the middle part of the High Street. Climb until you reach the war memorial in the middle of the road. On your left you will see an number of alleys or twittens which are a characteristic of the town. On your right you will pass a bookmakers which is believed to be one of many buildings in Lewes and Brighton owned by companies associated with Mr Van Hoogstraaten, who fought the famous battle with the Ramblers at the turn of the century. The first meeting of the first men against sexism group in England took place in the flats above here. The war memorial and the town hall to the right of it mark the historic centre of the town. It was here that 17 Protestants were burned to death during the reign of Queen Mary. If you turn round and look back to the hills behind you, you may be able to the obelisk on the skyline that marks their memorial. This burning is the pretext for the annual November the 5th celebrations which bring the town to a halt. Some Catholic residents leave town on the day but others join in as the celebrations have lost nearly all of their sectarian edge. One reported to me “We go down swinging our rosaries and encouraging people to celebrate Guy Fawkes as the only man to enter Parliament with honest intentions”- a sentiment more popular now than in the past. On your left inside tower is information about and a picture of Tom Paine, who lived in the town for a while. He is perhaps less celebrated here than he might be because he was a tax collector at the time. On Fridays this area is the site of a local produce market. Emerge from under the tower, pass some working toilets and turn left along a narrow road. Opposite the toilet is the needlemakers centre, a collection of unusual shops and a café. At the end of the road come to a junction. Walk straight ahead (Watch for cars coming too fast from the left). After 10 metres come to the Lewes Arms. (F) This is a typical Lewes pub. For many years it was owned by Beards, a Lewes company that had stopped brewing but kept its pubs. They stocked Harvey’s beer. In 1998 they sold out to Greene King, who started to withdraw Harveys from all the pubs. Last to go, in 2006, was the Lewes Arms. Promptly the clientele boycotted the pub and staged pickets outside. In 2007 the company gave in and reinstated Harvey’s beer. They subsequently sold the pub. If your favourite beer is Greene King it is probably best not to mention it in the town. A visit to the pub is recommended. Turn right at the Lewes Arms. Pass Darcy Clothing. In 2013 this was the headquarters of the Chap magazine, a must for stylish gentlemen. You might want to ask Ms Darcy if she can sell you a bobble hat. This is one of the more atmospheric of Lewes churchyards. In the churchyard is an obelisk erected in 1877 at the behest of Tsar Alexander II of Russia as a memorial to 28 Finnish soldiers of the Imperial Russian army, taken prisoner during the Crimean War, who died of disease in Lewes Naval Prison. Walk down Abinger Place, which leads south from the church to its junction with the main road. Look out for a plaque marking the site of the original town gallows. It is on the right of the road in the wall by the gate to the first of a row of houses on the right, about half way up the street. The inhabitants do not seem too keen to draw attention to it. Go straight ahead up Castle Banks. At the top turn right. You will see a seat to your right. This is a good place to view the site of the Battle of Lewes A display board tells you what to look for. Bear left, keeping a bowling green on your left. This is the former tilting yard of the castle and has been a bowling green since at least 1640. Continue through the castle gate and see Lewes Castle (E) entrance on your right and the Barbican Museum on your left. You may want to spend some time exploring these. Following the main route you pass the County Court on your left. At the traffic lights turn right down Station Street. With its narrow pavements and chicanes Station Street does its best to intimidate both pedestrians and cyclists. At the bottom of Station Street you meet your outward route, but you turn right. Pass the council offices and an old horse trough. At the next junction see an entrance to a park to the left opposite. Go through this and enter Grange Gardens (H) which are attached to the 16th century Southover Grange. This is a good place for a picnic. There is a kiosk in summer selling refreshments. Explore the gardens any way that pleases you, but aim to end up at the gate which is diagonally opposite the one that you used to enter the gardens. You will need to cross the Winterbourne Stream at some point. Note the fine Georgian Crescent opposite, completely out of scale with everything else. Turn right at the mini roundabout and walk past Southover Church on your left (evangelical Anglican) Keep straight ahead to find Anne of Cleves House (J) on your right. The house was given to her by Henry VIII as part of her divorce settlement. She never lived there, but benefited from the rent. Having inspected the house, turn back the way you came and then take the first on the right. Note the flint walls that were once part of Lewes Priory. Pass under the railway and then turn left immediately before the sports club. You will now see the remains of Lewes Priory(K) in front of you. Pick any route you like through the Priory. You are aiming for a gap in the wall on the opposite (eastern) side of the Priory, which lets you into a playing field. Once in the playing field turn left and then right on a concrete path. Then turn left again, heading north. On your left is the modern bowls club. On your right is the Dripping Pan, home of the mighty Lewes FC. The ground must one of the most historic in the country in the early part of this century Lewes attained the giddy heights of the Conference Premier, the fifth division of English football, on the back of finance provided by the same property developer that now owns the bus station. Now they are community-owned but results are not, at the time of writing, going well. However they are famous for their artistic match day posters. On your left past the bowls club you will see another former toilet, now converted into a house. Turn left at the road and then immediately right to head towards the railway station. If you started here you can turn right into the main entrance to the station to finish your walk. If you started elsewhere continue past the station and then turn sharp right at the junction to descend to point 1.